Robert & Bernice Leekya Sleeping Beauty Turquoise Graduated Row Bracelet size 6 7/8"
This eleven-stone row bracelet, though recently made, is a classic nineteen seventies design. 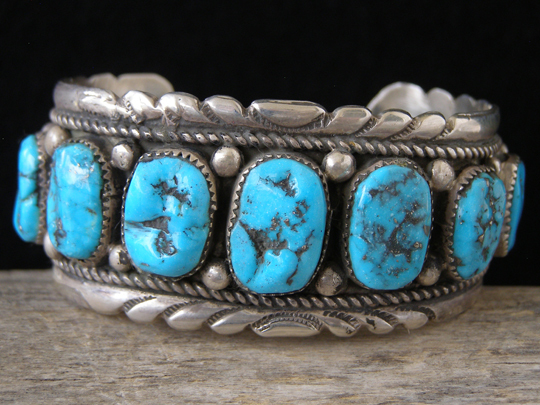 The grooved and filed edges of the cuff and the "Zuni cut" Sleeping Beauty turquoise bespeak that earlier era of design. "Zuni cut" turquoise has an irregular surface because a grinder is used to cut out large areas of dark matrix from the rough rock turquoise. While the stone still remains mottled with dark matrix, grooves, valleys and undulations are seen on the surface of the stone where larger chunks of matrix were ground away to liberate this rich blue. This is natural, untreated Sleeping Beauty turquoise chosen for its gorgeous color and cut the old-fashioned Zuni way. Though the Sleeping Beauty Mine is closed and this stone is no longer generally available, the Leekyas have their own personal stockpile. Hallmarked RLB inside with the center L for Leekya twice the size of the R and B for Robert and Bernice. Also stamped Sterling inside.